But when will the system that turns children into careless accidents or meal tickets be radically overhauled? Because until then, none of these other investigations and re-inventions will matter a damn. 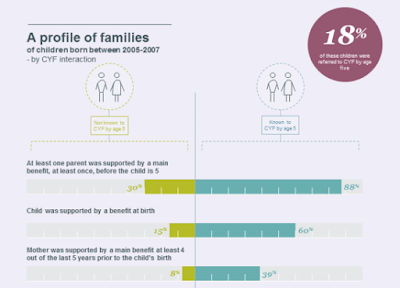 There have been welfare reforms but the number of children being born into beneficiary families remains at the same level.  36 percent had parents who were known to CYF as a child. "In 2014, CYF received 152,000 family violence notifications from Police involving 97,000 children. The majority of these were not acted upon as the nature of the concerns did not reach CYFs threshold for response and there was a lack of alternative services to address the needs of these families in the community." My initial reaction to this was utter surprise. A majority not acted on? That seems shocking. But that's because it's not right. In 2014 there were 57,889 family violence referrals from Police and 88,768 care and protection reports of concern. Notifications comprise “reports of concern” (which may require action by Child, Youth and Family) and “Police family violence referrals” (which do not require action by Child, Youth and Family). We receive reports of concern from Education, Health, Police, Courts, social service providers, family members, and members of the public. Police family violence referrals are not assessed by Child, Youth and Family. Police family violence referrals are the result of Police attending a family violence incident where children are present or normally resident at the household concerned and where Police assess that Child, Youth and Family action is not required. These notifications represent a significant opportunity for early intervention to provide the support families need before concerns escalate into situations of harm to children. Which and how many? Can sound recommendations be made based on unsound data? It's only 10 to 15 years since many of us were fighting the introduction of Paid Parental Leave, Working for Families, interest-free student loans AND Kiwibank - Jim Anderton's pet project and National's latest pragmatic point-of-sameness. The principles behind that opposition have not changed. But our current government has abandoned them. My son, who is no intellectual slouch, has taken to ridiculing the free market. I point out that libertarianism cannot be blamed for the last recession. That no libertarian would support government bailing out private financial institutions. YES he says but you would support deregulation of them. I counter that deregulation can only succeed when consequences are real; when they cannot be avoided through bail-outs. So, he says, you would support allowing financial collapse just to teach people consequences? You get the circular nature of these exchanges. The up and coming voters have been taught to blame greed and exploitation on the free market (which has not actually been free) as if the free market is just a beast that governments tolerate; that governments can and should control in the pursuit of utilitarian goals. The collective memory of a society functioning without (or at least with a smaller) welfare state - mass compulsory wealth redistribution - is fading. Mass redistribution brings with it commandeering control of each major aspect of life - education, health and welfare. Once government assumes the responsibility for financing provision of these, it must then gradually assume control of each and every personal action which imposes an associated cost. The idea remains abhorrent to me. Earlier dissenters seem lulled or numbed into submission. NZ may have a so-called right-of-centre government but Labour's 'Third Way' has triumphed. Helen Clark may feel like she has a "stadium of 4 million people" behind her - and judging by overwhelming opinion expressed today she has - but she can count me out. I respected Clark as a PM for acknowledging the problems of chronic inter-generational despondency and dysfunction. But even then she would not move against the prevailing feminist and socialist theory of (false) empowerment of women - the DPB. Back on the DPB band wagon? Being petty when NZ could have the first woman heading the UN? 2/ I do not care about nationalism or feminism. I do not get warm fuzzies about the connection Clark has to New Zealand or to my gender. It has made me deeply uncomfortable today that so very many, John Key included, are prepared to forget not personal animosities (they are small beer) but the ideological antipathy that freedom- embracing, small govt acolytes had for Clark. Whoever the successful candidate is (notwithstanding the arguable impotence of the UN) I would prefer someone who has not made it their life's work to advance the responsibility and power of the state to enrich lives. Yesterday I made a prediction about the response to Rodney Hide's account of chasing a shoplifter. Quite bizarrely the type of reaction I predicted has come about, but not in the comments section after Rodney's column. The gap between rich and poor is widening and with the long term stagnation of wages, theft for some is a desperate option while for organised habitual offenders, it's simply what they do for a job. But Bowron isn't just an apologist for the victims of inequality. She even sympathizes with the second group. The latter are relatively small-scale operators trying to make a buck, while corporate theft is allowed to go unchecked, is lauded and treated as a swaggering success story. And earlier in her piece she refers to the "hugely profitable" status of the supermarket being ripped off, as though that also somehow balances the books. But just as her defence of thieves is muddle-headed, so is the column in its entirety, the conclusion being citizens should arrest these offenders. If we could just get over our apathy and take the global citizen's arrest principle wider, we might strike a blow against the empire of our own apathy. Why suggest that joe public should pursue and apprehend an individual who has just been painted as some sort of latter-day Robin Hood? Rodney Hide writes a column about supermarkets' inability to defend their property from shoplifters because of asinine assault laws. I will make a prediction about the comments that will ensue. It is a tragedy that a man has to steal to feed his family. And it's your politics, Rodney, that caused mass unemployment and poverty in this country. After all, the left has been excusing theft for decades. Never mind the small matter of job opportunities in Christchurch and the surrounding regions. The fact that Canterbury has the lowest unemployment rate in NZ is just inconvenient.